Marketing your business isn’t hard. There are literally hundreds of ways you might go about it. They are not all equally effective, but you’ll soon have more clients if you follow a few basic steps to develop a marketing strategy that works, implement it regularly and measure its impact. As we’ve seen, the bottom line is that you need a steady flow of prospects to develop your business. The adoption of an approach that uses many different but interlinked marketing strategies will have those prospects beating down your door before too long. In this chapter, we’ll discuss these strategies in detail to uncover those that will work best for your business (but don’t forget that you can download this and three other chapters if you’d like to hang onto this information to implement in your own business!). Contrary to popular opinion, your advertising and promotion efforts need not be expensive. In fact, they should be very cheap and highly profitable. Rather than implement marketing strategies that run at a loss, you want to do what works. You need highly targeted, results-driven marketing to generate that lead, qualify the lead, find out how you can help, and then offer a solution. Bingo! Another sale on the way. Ask those people to buy it. There are many different ways to gain the attention of your market — and that means many different ways to waste money! Therefore, it’s crucial to be smart about your marketing. Measure the results and crunch the numbers to find out what works best to gain attention. If you can attract a steady stream of prospects to your door, your business will grow. How can you create that steady stream? Simple — regular marketing means regular prospects. Regular direct mail, regular advertising, a regular newsletter, regular networking, regular offers to local businesses — whatever you do, do it regularly, and you’ll generate those prospects. As prospects see your brand in more places, and hear about you from more of their business contacts, your name will begin to grow familiar to them. Once they’re used to your name, they’re only a small step away from feeling that they know and trust you — and then they’ll start calling. Would it be best to cold call your prospects? Would it be best to write your prospects a letter to tell them of your services? Would it be best to present a seminar entitled, "Attracting more business using the Internet"? Example 6.1. $20K in Thirty Days! Send a special-offer letter to all our current clients, then follow up with a telephone call. Complete a direct mail campaign to 200 local businesses — a three-piece mailer spread over three weeks. Run a five-week business newspaper advertising campaign. Launch a PR campaign, including media releases announcing that the company is the new developer for a major site, the promotion of a team member, the release of a survey we’ve commissioned, and a few other bits and pieces. Ask all of our current clients for referrals. What were the results of our campaign? The advertisement, which cost $70 per week for five weeks, secured us a $7,800 web site deal with a $300 monthly ongoing marketing fee. The PR campaign delivered another $5,000 worth of work with strong potential for more. A current client took up our offer of site management services priced at $110 per month, and asked us to implement her online marketing campaign, which meant another $5,000 per year. The mailout to local businesses generated three qualified leads to follow up. A quick calculation reveals that we achieved our goal of $20,000 in additional income in just a few weeks. The key point is that nothing will be accomplished by your sitting around waiting for people to realize the existence of your business. You might be a hot designer, but people need to know about your services before you can make anything of your talents. The whole aim of marketing is to generate interest. What’s the best measure of "interest?" Leads and sales. Marketing your business shouldn’t just be inexpensive — it should be profitable. It should be profitable because it works. It should work because it is highly targeted and effective. Simple! Targeted marketing ensures return on investment: the return you generate from your marketing efforts should far outweigh their cost. Your marketing success stems from finding people who aren’t your clients, but should be. The people who should be your clients won’t differ much from those who are the current clients of your competitors — in other words, those clients have all the characteristics of the clients who would buy your services. The discovery of these characteristics is the first step toward defining your target market. Prospects with the greatest potential to become your clients will generally live within a 50-mile radius of your business. Prospects with the greatest potential to become your clients will operate a business, probably a small business. Now that we’ve found a common thread among your potential clients, the next step is to find out how these prospects might hear about web development businesses that offer the services they need. Keep in mind that the current clients of your competitors have all the characteristics of the people who would buy your services. What characteristic — in addition to the two we just discussed — identifies the current clients of your opposition? They all have web sites. It’s time for action! It’s this simple: call the businesses in your area who have web sites, tell them you’re surveying the ways people hear of web development firms, and ask how they first heard of the firm they use. Don’t try to develop the relationship any further than that — you’re just completing research at this stage. The people you call will usually be happy to help, and before you know it, you’ll have a fantastic idea of what tools you should use to market your business to the right audience! You’ll also gain the names and addresses of about 100 businesses who have web sites and who now have a relationship with you. Mail them all a thank-you letter for participating in your survey, along with a summary of the survey results. Keep in touch, making some marketing contact with them every three months. Soon, a few of these prospects will inevitably start to trickle over to your business. To improve the way our survey call is received, we make the results of every survey we complete available to our local media, and, on occasion, national media. That way, when we call businesses that might belong within our market, we can say: "We’re currently completing a survey that will be made available to XYZ Television Station. The survey question is: how did you first hear of the web design firm that developed your web site?" This approach lends you instant credibility, and increases your response rate. If the people on the other end of the telephone know that the survey will be made available to the local TV station, they’ll search high and low to find you the answer! These simple steps provide you with an excellent basis from which to launch your marketing. However, you’ll find even more valuable information if you focus a little more deeply. From the survey you’ve conducted, you know how most of the businesses in your area hear of web sites designers. That’s a well-targeted market! Now you can grab your market’s attention with laser-like precision. Moreover, because your marketing is so well targeted, it should be very successful. My business is perfectly situated, it being directly above a bakery, a cafe, and a pizzeria! These business are all doing an excellent trade — apart from the cafe. That’s changed hands three times in the past 12 months, simply because the operators don’t target their market. The market for the cafe would be people located within a five-mile radius. An even better market would be people within a 100-meter radius. The absolute best market would be people who work in offices within about 50 meters of the cafe, which is open largely during business hours. At any point in time, my business might have 12 people working away. Almost all of us like to eat out for lunch, or at least step out to buy our lunch to bring back to the office — and then there’s the coffee runs. Yet, in the 12 months we’ve been in those offices, we have never had the cafe staff knock on our door and say, "Hey, you guys! Come and eat lunch with us! We make killer kebabs, sensational sandwiches, and perfect pies, and we’ll treat you like the valued neighbours you are! Here’s a voucher for a special deal to try us out this week — come on down!" You’re in business, and you want to sell whatever it is you sell. Tell people about what you sell. Ask them to buy. The owners of that cafe should be dropping their new menu in to us every week. They should be wandering around the nearby offices, introducing themselves. They should letterbox-drop flyers galore. They should have fabulous big signage outside their premises. And they should do whatever they can to tell people that they’re in business, and that they have something to sell. Only then will their cafe be a successful one. I’ve said it before, and I’ll say it again: there are many different ways to attract the attention of your market. When people think of marketing, they tend to visualize large-scale, costly tactics, like radio advertising or newspaper inserts. Be aware that not every marketing tactic you use has to be a huge one-to-many transmission like a flyer or an ad in the local paper. In fact, a small-scale promotion allows you to target the needs of a particular market segment with much greater precision. In my business, we often turn to small-scale, carefully considered promotions in order to generate leads from highly qualified prospects. This might see us run a competition from the local stationery supply store, where we offer a free template-based web site as a prize for a winning customer. The stationery store owner is happy to allow us to run the competition from his store as it makes him popular with his clients, especially the lucky web site winner. For our trouble, we receive the 100 or so entry forms submitted by competition entrants. We have 100 names, titles, business names, addresses, and telephone numbers of business people within our area who have expressed interest in a web site. As you’ve guessed, these forms are the basis of the next step in our marketing process. These competition entrants are mailed a "You’re a winner" letter, which informs them that although they didn’t win the free web site, they have won a free mouse pad (featuring our branding, of course), and a free hour-long consultation with a web consultant to help them identify whether or how their business would benefit from a web site. The letter finishes by telling them that the writer will be in touch. That letter is accompanied by an article we’ve written, entitled "Does your business need a web site?" In addition to this, we include some articles that have been written about us, along with testimonials from happy clients. Now we have 100 potentially hot prospects, all expecting a call from us to set up a meeting to discuss their needs for a web site. We don’t ask them to call us — they wouldn’t get around to it. Let’s look at the characteristics of this market segment. They want a web site, otherwise they wouldn’t have entered the competition. They’ve been educated about the benefits of a web site in our letter and article. They know about our business, which has also benefited from the implied endorsement of the stationery store, increasing our perceived credibility. From those 100 hot prospects, I’d be very surprised if we didn’t make at least three sales. That’s three new clients: at least $6,000 even if they only want teensy-weensy web sites. Three more clients on our ongoing list, and three more clients to give us referrals. They’ll almost always choose from the two options that will cost them money. We have a client who manages a resort and runs a monthly competition for two nights’ free accommodation. Of the winners, 80% extend the length of their stay by up to five nights, and 42% rebook within the next 12 months. Now, these are just a couple of ways to market your business for a minimal investment. Don’t blindly follow the herd by throwing good money away on marketing tactics that won’t work their very best for your business. Research your market, talk with your market, analyze your market — that’s the way to cost-effective marketing. Tightly targeted marketing is inexpensive and should generate a decent ROI. The perfect lead is well-qualified, so try to use marketing tools that prequalify the potential client. Now that we’ve discussed the importance of highly targeted promotions and qualified lead generation, it’s time to turn our attention to some of the more common marketing alternatives. In this section, I’ll be a little more specific about advertising, promotion, and public relations (PR). We’ll look at how you can assess the potential of a particular marketing tool. We’ll also consider a range of different tools, and what they can and cannot do for you. Lastly, we’ll delve into PR in some depth — if you’ve ever wanted to know how to write the ultimate media release, keep reading. There’s no right answer to that question. There are all sorts of cultural, economic, and local considerations that impact on the effectiveness of every advertising medium. However, here are some general guidelines that will help you assess each different medium you consider using. Study the audience survey you completed to see whether the particular advertising medium you’re considering is mentioned. There’s no point advertising in the newspaper if your target market didn’t identify it as one of the ways they found a web developer. Similarly, there’s no point advertising in a particular newspaper if no one in your target audience reads it. Rely heavily on your research — that’s why you go to the trouble, after all! CPM stands for Cost Per Thousand, M being the Roman numeral for 1,000. CPM is the most analytical and objective measurement you can make of a communications vehicle. Once you know how much it costs to use a particular means to contact 1,000 businesspeople, you can easily compare the costs between media. CPM works like this: the local newspaper reaches 50,000 people. You can buy a half-page display advertisement in the paper for $1,000. Therefore, if we divide 1,000 by 50, we find that it’ll cost us $20 to reach a thousand people. Obviously, the lower the CPM, the better, but keep media waste in mind . Media waste refers to the number of people who see your ad, but who aren’t in your target audience and don’t have a need for your services. Usually, the more mass, or general, the reach of the medium you use, the more media wastage there will be. For instance, a TV ad on the local television station will likely reach far more uninterested parties than will a direct mail campaign targeting businesses in your area that lack a web site. The CPM of a newspaper ad might be cheap at $20.00, but if 90% of the paper’s audience aren’t in your target market, it doesn’t matter how low the CPM is, you’re still wasting a lot of media — and money! Over the years, I’ve taken out expensive newspaper advertisements and I’ve taken out cheap classifieds. Surprisingly, the cheaper classifieds have given my business a better return on investment. If the local TV station representative is trying to sell you some space, choose an advertisement or two you see running on that channel, and call those advertisers. You’ll soon gain a reasonable idea about what sort of response those ads are generating for those businesses, and this will help you decide whether it’ll be worth the cost for your business. Timing is important. It’s not news that some times of the year are simply a dead loss for web design businesses. For example, most businesses close down over the end-of-year period, while their owners are off enjoying the season’s festivities. There’s no point wasting your money on advertising at that time. Timing can even be considered when it comes to choosing what day of the week to advertise. With newspaper advertisements in my home city, we’ll generally only advertise on Wednesdays and Saturdays, as wide research indicates that those two days have by far the biggest readership. Budget is a major consideration — it’s not how much you spend, it’s how well you spend it. Running three radio advertisements across three days might be within your budget, but it won’t be of any benefit. Some media, like radio, require repetition of your message in order to be effective. If you don’t have the budget to suit the medium, then don’t bother buying the space; save your money for a more effective way. Having said that, there are often great deals to be had and you’d be surprised how much you can haggle radio spots down — once the day has passed, the radio station can’t sell that time again, so they’re often receptive to last-minute deals. Keep track of your expenditures using the Marketing Budget that’s included in the budget spreadsheet on this kit’s CD-ROM. The fact that an advertisement generates an inquiry doesn’t necessarily mean that it’s successful. For example, one of my clients is currently running an advertisement in a local free weekly newspaper. His thinking was that if the ad generated one new client in 12 months, the advertisement would have proven successful. Wrong! The ad has been a disaster. After 16 weeks at a cost of $60 per week, his ad has generated 12 inquiries and he’s yet to make a sale. Yet he estimates that meeting with the 12 prospects who inquired, putting together the proposals, and talking on the telephone with these people, has cost him in excess of $2,000 already. He now subjects each lead to a fairly rigorous qualifying process before he takes the process any further, and he’s trying to off-load the advertisements, as he’s tied in to an advertising agreement with the paper for the full year. It’s not only about leads generated?it’s about the quality of that lead. It’s been my experience that prospects who find us through our Yellow Pages advertisement are far less likely to become clients — often they’re just people searching around for the absolute lowest price. Conversely, people who are referred to us by happy clients are far more likely to become clients, because there’s an inherent trust from the very start. I can’t give you the definitive answer to that, I’m afraid. However, taking into account the targeted marketing tips I provided earlier, we’ll discuss a few of the popular options for advertising, promotion, and PR efforts. All of the techniques listed below are perfectly capable of generating new clients in droves, given the right circumstances. Your challenge is to identify which option suits you, try it, and measure the results so that you can improve your ROI in your future promotional efforts. Newspaper advertising needs to be really well targeted to be successful. It would probably be more cost effective for you to advertise in a business newspaper, rather than the local community newspaper. Base your budget on the CPM mentioned in the section called "Analyzing the CPM." In terms of the size of your ad, it’s advisable to start small and increase the size of your ad as you measure its effectiveness. Of course, the downside of this approach is that if you start small not as many people will see your advertisement, and it may not be a true measure of the effectiveness of advertising in this particular newspaper. The moral of the story with newspaper advertising is to test, as cheaply as you possibly can. With any advertising you just need one client to make it worthwhile. 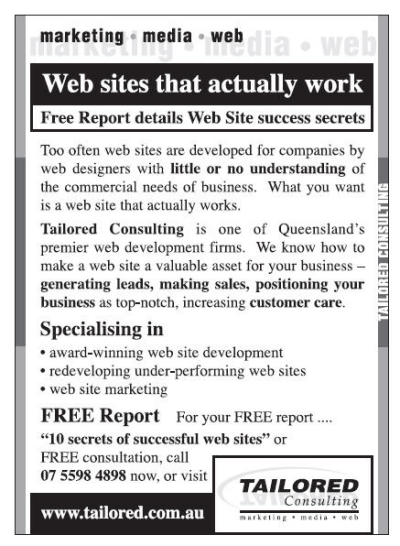 I remember taking a small ad in a business newspaper a few years back. Nothing came of it until a couple of years later, when a prospect called to arrange a meeting — she had that tiny advertisement from years before. We’ve since completed almost $10,000 worth of work for her company. Advertising in your local Yellow Pages is almost a must-have for your business, as many people will turn to it when choosing a designer. These ads can be very expensive and, unfortunately, with this medium it’s a case of the bigger, the better. If you commit to buying a large, prominent, and expensive Yellow Pages ad for a year, then make sure to very closely measure which clients find out about you from these ads, and what sort of return you receive on your investment in order to ascertain what you should do for the next edition. We find we generate a few decent clients from our Yellow Pages listing, but also get a lot of inquiries that don’t amount to anything. Radio spots are not usually well targeted. Don’t advertise on radio unless you can try it out very cheaply, and be sure to track the results. If you try it and it works, great. Do it again. A radio appearance, however, can be a great way to boost your profile. For instance, if you can be interviewed as a special guest during the computer show on your local radio station, you can attract real attention to yourself and your business. I managed to get a regular gig on talkback radio as the resident web expert — every Wednesday I’d go into the studio for a chat with the host about what was new on the Internet. That ensured, for the radio listeners at least, that I was perceived as an expert, generating a lot of business as a result. If you can have a "Why you might need a web site" article accepted and published in a business magazine, it can work very well to generate leads. Writing articles is an excellent form of PR, and allows you to borrow credibility from the publication in which your article appears. As the only expense involved is the time it takes you to write the article, this form of promotion can be very cost-effective. Flyers are okay, but only because they’re fairly cheap. You can target them a little — by delivering them only to local businesses, for example — and with a little luck you might receive a call or two as a result of your efforts. Like that tiny ad I mentioned earlier, you never know — sometimes you just need the right flyer to fall into the right person’s hands to make it all worthwhile. Why not hold a seminar titled "Developing a Web Site for Your Business?" It’s beautifully targeted, you have the opportunity to build enormous credibility, and you have a group of hot prospects in a room for a day, learning all about the Web — direct from you! Spend $1,000 to promote the seminar, fill up a good-sized room, and you’ll likely gain your business some great leads. The trouble here is that you have to spend a little to make a little. Charge a token fee of say $10 per head, so that your audience perceives some value in spending a day with you. Granted, you may not make much of a profit from the event itself, but it’s the lead generation that’ll benefit your business in the long run. It didn’t take me too long to realize that the vast majority — and most profitable part — of my business came from prospects who were referred to us by past and current clients. We now ask everyone we know to refer their friends or business contacts to us. If someone refers us a client, we thank that person in all sorts of different ways. Referrals are perfectly targeted, and don’t require any work on your part. If you’re not asking everyone you possibly can for referrals to your business, then you aren’t serious about being in business. Asking for referrals seems to intimidate a lot of people — I’ve found the method that works best for me is to just relax about it and be casual: "Megan, do you have any friends or colleagues that are looking for web services? We’d appreciate any referrals you can send our way." I found that when it’s a simple request like that, clients tend to want to help out. Another rich source of referrals can be your local providers of computer and Internet-related services. Contact them to establish a reciprocal arrangement through which you refer hosting clients to them if they refer web design clients to you. This arrangement can also work well on a commission basis. What influences people to select your services, out of all the options in your line of business? I’ll bet it isn’t how nice your branded coffee mugs are. Having said that, I do find these products great as gifts for clients you want to thank for some reason — after all, it’s good to keep your business firmly in their attention — but this kind of expense can only really be justified when you’re well established and very profitable. Another great lead generation tool is to write a report devoted to making and saving money with a web site, and give it away for free. Once the report’s finished, take a small ad in the local paper, do a post office box flyer drop, send targeted direct mail, and shoot out a media release promoting your report. You’ll soon have prospects on your doorstep! We have a number of free reports we use as bait to generate leads, using a variety of sources — Figure 6.1, "Free report advertisement" shows an example of one of our newspaper advertisements that worked well. Another idea is to include a tips sheet as part of the free report. Then use this tips sheet as the main part of your media release, which you write like a top-ten list, such as: "The Top Ten Ways to Avoid Being Ripped Off on the Internet!" That sort of release, backed up by some research, will almost always get a run in relevant media. Advertising in newspaper classifieds is very inexpensive and can work quite well. Its cheapness means that testing it out is well worth it. Guest speaking is free, and generates real interest on the spot. You’ll be perceived as an expert, you’ll learn the techniques required for public speaking (a huge advantage), and you’ll be exposing yourself in the nicest possible way to your potential market. Recently, I had the opportunity to speak for a government small-business program. I was marketed as the keynote speaker for the occasion, and I spoke for an hour to 120 people who were interested to hear what I had to say. The topic of my presentation was nothing other than the very service that I sell — on which the attendees could only see me as the recognized authority. In that hour, I had the opportunity to say exactly what I wanted to say without interruption. I provided interesting, relevant, and entertaining information about a topic in which the audience was interested. I had the opportunity to connect with the audience, to demonstrate my expertise, to talk about my experience, and generally to market myself and my business. By the end of the speech, the audience knew me and what I’d done previously, and saw me as an expert. The work generated from that seminar alone was worth a very substantial amount to my business. Printed brochures can be good, but only once you’ve established your business. While the cost of brochures has decreased significantly over the years, I see brochures as more of a sales assisting tool rather than a tool that will help you generate leads. When you’re starting out, it’s much more cost effective to demonstrate your professionalism in other ways that require a smaller initial outlay — our research tells us that fewer than 20% of an audience will actually read your brochure. Newsletters are great! They’re cheap and they’re easy. By using a desktop publisher and some decent paper, I can produce a great-looking newsletter for about 60 cents a copy. For some reason, people seem to attach more credibility to the printed word than they do to an electronic message. Newsletters can help build recognition and improve perceptions of your credibility within the market, especially if your newsletter’s continued regularly, over a long period of time. That said, we also use enewsletters as a marketing strategy. We have a general enewsletter that goes out to our web site subscribers, another that goes out to our client list, and yet another that goes out to our prospects list — a very easy process with the aid of ConstantContact. It’s all about keeping reminders of your business in front of prospects, and providing offers on an ongoing basis. Love it or loathe it, networking is a must. Join the local business groups, go to the lunches, attend the charity golf days. Once you’re out and about in the local community, you’ll give your business a strong advantage. Remember, however, to keep a close eye on the amount you spend on these events, and analyze the return you make closely. This can be a little difficult to quantify, as the contacts you meet today might not lead to anything for a good while. I’m the vice-president of a local media charity organization, I’m the president of my son’s scout troop and I’m the keynote speaker for a local business college’s annual event. I’ve met a lot of local businesspeople through these associations and have the added advantage of being seen as a leading figure within these organizations. It makes sense to join business groups: you meet lots of useful contacts and potential prospects. Are you a member of your local chamber of commerce? What about a local charity group? Perhaps you could do a public-speaking course or join your local Toastmasters group — learn a new skill and meet people who are, more than likely, in business. Describing your business and the benefits you provide on a video, DVD, or CD is a great idea, right? Not really. People are actually quite unlikely to watch the video, nor will they look at the DVD. You’d think they would, and these media do provide a great way to demonstrate your expertise, but it’s too easy for people to procrastinate with any media that can’t just be picked up and read. If someone dropped off a DVD to your office, would you be likely to find time to look at it? Sponsorship opportunities usually require you to provide cold hard cash or services. The impact of these kinds of arrangements is very difficult to measure, as sponsorship rarely provides an immediate response. It’s a strategy probably best left to larger companies who want to put their branding out there, at least until your own business grows large enough and profitable enough to bear the cost against an uncertain return. Love it, love it, love it! PR’s free if you do it yourself, and the impact can be enormous if you get your story covered on a decent TV show, radio program, or newspaper feature. PR’s greatest benefit is that it doesn’t have to be particularly well targeted if it reaches one million people in your city, and it doesn’t cost you anything! The media has enormous power and influence, and is always looking for good stories to run. If you have a newsworthy story, it might well be run — giving your business tremendous exposure. Let’s take a closer look at this form of promotions. Public Relations covers a wide range of activities, but in a promotional sense, it’s about building goodwill for your business by gaining unpaid media attention. The whole premise of PR is that you borrow credibility from the media, rather than looking like an advertiser who’s simply paid for exposure. So, how does it work? First, you have to attract the media. You can gain the media’s attention in two ways — the easy way, or the hard way. The easy way is to write a concise, well-constructed release about your newsworthy event. The hard way is to write a sloppy release on something that nobody cares about. Media releases should be one page long — and one page only. You need to tell your entire story succinctly within that single page. Your release should be on A4- or US Letter size paper only, no odd sizes. The paper on which you write your media release must be plain white, not colored — no letterhead, no logo, nothing but white. As you grow a bit more confidence, and become recognized by the media, you might be able to bend these rules — this will probably be okay once you’ve established yourself a little. But to begin with, stick to these guidelines. Now, let’s look at what you need to include in your release. The timing of publication of a media release can be extremely important in some cases. To let the media know when they can use a release, it’s common practice to include release timing details in the upper-left corner of the page. You have two options; choose the one that’s more appropriate for your purpose. You can either write "For immediate release," to let the journalist know that they can report upon the information at any time. Or you can write "For release on October 1, 2007," which lets the journalist know if your story is urgent or time-relevant. The headline of the release is next. Your headline has an important job: it must grab the attention of your readers, and encourage them to keep reading, so it has to be compelling. Make it as interesting as you can. In the first paragraph, tell the whole story: the who, what, when, where, and why. Tell the whole story in two or maybe three sentences. It’s sometimes a little tricky to contain your information to this degree of brevity, but it can be done. The third part of your media release should contain your call to action. What do you want to have happen as a result of your media release? As you write, think about your release from the point of view of someone who doesn’t know you or your company — this forces you to answer the question of the care factor. Who cares about the information you’re discussing in the release? If you can’t answer that, then your release isn’t newsworthy. If you can answer that, make sure you write the release in a way that will be interesting to them. When the release is complete, write "ENDS" on its own line. Below this, write: "For further information, contact:" followed by your name and phone number. Send your release to the right person. A quick call to the reception desk at those newspapers or television studios you’re targeting should provide the information you need. Make sure the information is newsworthy. This is vital. No one is interested that you’ve redone your own web site. Start with a brief description of the news: the who, what, when, where, why, and how. Send it to the right person! There’s not much use sending your IT story to the sports journalist. Follow the structure outlined here — don’t deviate from this plan! These are the standard rules you should keep in mind when you write a media release. Stick with these and you’ll have a professional-looking release, for which you won’t have had to pay hundreds of dollars! With the range of distribution outlets available these days, it’s a simple matter to pay a media list to shoot your release off to 500 editors across the country. Is that the best course of action? Or should you sit at your fax machine and methodically send out release after release to the editors you’ve targeted? Perhaps you should send the release off to an Internet-based service for rapid email distribution? The best way to distribute your release depends upon the type of release you’re sending. As usual, I’d suggest you test various methods and closely monitor the results. You might find that your Internet-related media releases have great success when distributed via an Internet-based service. Once again, it’s all about targeting. In my company, we first identify the specific publications or media we want to target, then take a look at what they produce and the news angles they take. After that, it’s a simple matter of writing our release specifically for that publication or show that editor, or that particular journalist. Panic, start um-ing and ah-ing, stammer out a few long-winded answers, and generally squander the opportunity to get your message across. If you choose the second option, you’ll need to be ready ahead of time. The point is, when you prepare your release, to prepare for what may happen afterwards. Prepare for the interview, thinking about what the journalists would want to know. In my experience, they want information: they want it concise, they want it relevant, and they want it now. It’s your task to give them what they need to do a good job. Make it as easy as possible for the media to do their work. Most people seem to assume that journalists are hunting around for the dirt, that they’ll grab any slip-up you make and turn you into a laughing stock. In my experience, this hasn’t been the case. The vast majority of journalists I’ve dealt with have been professional, accommodating, and have taken great pride in putting together a story that’s interesting and top quality. If you don’t have much experience with the media, rest assured that they won’t make your life harder. They’ll almost always guide you through the process and make it as easy as possible. When you’re speaking with the media, try to relax. Imagine the interview is a friendly conversation with someone who wants to learn a bit more about what you have to say, because that’s exactly what it is. The local television station has sent out a journalist to cover your media release and you find yourself featured on the evening news. It makes a big impact for business and lifts the business profile a mile! Fantastic! What’s next? Do you send the journalist a gift of a dozen bottles of wine, send them out for dinner, or just send money? No, you don’t. The journalist would see that as a rather obvious bribe and be offended. It really helped having a professional treat me with kid gloves so we could look our best. We have had some tremendous reactions to the story. First, the confession: I’ve done this once or twice, and I’ll never do it again. Scout’s honour. Imagine you’ve written your release, honed your headline, penned a terrific opening, and presented all your information on one page. Your contact details are all there, the release is well formatted, and it’s newsworthy. You’re off to a great start! Now, you fax or email it to the editors at various media outlets. Then, you ring every single person that you faxed the release to, and say those magic words: "Just checking to see if you got my media release?" Editors don’t enjoy it. They have your release. If it’s newsworthy they’ll follow up on it. Leave them alone — don’t be that annoying person. I’ve done the math, and here it is. Let’s say you fax your media release to 100 editors. Later, you start the follow-up telephone calls. Each call costs an average of $1.00 and takes three minutes to make. The tricky part is in actually finding the person you want to speak to. It takes an average of two phone calls to find the person you’re after. That’s 200 phone calls, 600 minutes, and $200 you’ll spend following up that release. For that $200 I could fax a release to another 500 editors! Considering 600 minutes is ten hours, that’s a full day’s work — your time could be better spent. Good PR agencies have vast experience in assessing whether your media release is newsworthy — and if it isn’t, they can provide some suggestions on how to make it newsworthy. If it is newsworthy, they can ensure that it’s written in a concise and effective style that will attract the attention of an editor or journalist. The big advantage of using a PR agency is that the PR person is in the industry. The PR person regularly talks with editors, journalists, and other contacts. The PR person has already established a level of credibility with a circle of journalists. Think of it this way. Imagine we take two copies of the same release. One is sent to the local newspaper by Joe Smith of Joe’s Web Development. It’s Joe’s first release. The other release is sent to the paper by the PR person. In a perfect world, they’d both be read. In the world we actually live in, however, the PR person already has credibility with a press contact at the paper, so it’s more likely that this person’s release will be read first. Don’t get me wrong. The media is after top-quality, newsworthy stories, and doesn’t care where they come from. However, the media person’s previous experience with the PR person will go quite a way to getting the release read. Having said that, I advocate doing it yourself — especially in the early days of your business. Using a PR firm can be expensive, and if you do the release yourself you’ll develop yet another skill which, in turn, will help grow your business. As an aside, we’ve taken both paths over the past 12 months and had better success with using the PR agency. Our ROI has been massive, yielding approximately $30 income for every $1 spent. The PR agency worked extremely hard and was focused on getting us into the media. The typical problem with starting a service-related business like web development is that you’re far more likely to be successful if you can demonstrate your products and skills. This is fine if you’re an experienced designer with a few decent sites under your belt. Nevertheless, if you haven’t yet developed any web sites, or completed any programming that you can promote as your own work, it can be a little difficult to convince your prospects that you’re the person for the job. What’s the right answer to the question of providing free samples of your work? There’s a lot to be said for not doing a free site unless there’s an obvious and achievable benefit for you. You’re in business, after all. But then there’s developing a free site … that pays. If you can see a real benefit in designing a site for free, then doing so might be worth its weight in gold. But be businesslike — put a few caveats on the production of this free site. Ask for homepage acknowledgment of your support. Request that the client organization send you a signed letter of thanks on official letterhead to frame and put on your wall, scan and post on your web site, and so on. Ask for permission to link to your site from their homepage. Have the client agree to recommend your business to any person whom they feel would be a potential client for you. My business has completed some free sites; in fact, we do one each year for a community organization within our local area. Just over a year ago, we completed a site for the local helicopter rescue service. They run a much-needed operation, with a budget in the millions that’s funded almost completely by public donations. Despite what I’ve just recommended, we didn’t actually ask for anything when we agreed to build their site. It just so happens that this helicopter service is a very professional organization that benefits from the services of its tireless, in-house public relations staff member, Carol. As soon as we finished the site, Carol arranged for the presentation of a plaque to thank us for the site. She also organized a media release on the launch of the site, which included full acknowledgment of our role in the project. The helicopter service team also recommends us to everyone they meet who might need our services. They act as references for us when required, and we recently received a large photograph of the helicopter in action, along with the plaque that says "Tailored Consulting, Friends of the helicopter service." Both the plaque and the photograph are on display in our office. They even provided a day for me to take along five clients for a "Crewman for the Day" training day, where we were trained in escaping from an underwater helicopter simulator, as well as winched 150 feet from a chopper into the ocean. To top it all off, Carol has also devoted some time to come into our offices and lead in-house training on the role of the PR professional within small business. We’ve generated two web site sales from our association with the helicopter service, and combined with the extra services Carol has provided, we’ve received a terrific benefit from completing this freebie — in addition to the warm fuzzy feeling that comes with knowing that we’ve helped our local community. It’s true that these events reflect more on the helicopter service’s professionalism to look after their sponsors than the sort of treatment you can expect from every client for whom you develop a free site. Yet the way Carol has looked after us provides excellent pointers to the benefits you need from agreeing to complete a free site. If you got this kind of exposure each time you completed a free site, you’d be a very happy businessperson! There are myriad ways to market your business — and myriad ways to waste your marketing budget! Don’t suffer analysis paralysis?try a few different options. Public relations provides you with instant credibility — write a newsworthy release for optimum exposure and make the most of the publicity generated by any free sites you build! In this chapter, we’ve talked about getting out there and doing some serious marketing to get your business up and running. If you don’t do any marketing, you won’t be in business long. If you implement poor marketing, you may be in business for less time. If you effectively market on a regular basis, you’ll build the foundations of a successful business. Qualified prospects will respond to the marketing you do. The best business comes from people who call you — these people are motivated and keen to go. These are the prospects you want! You’ll generate referrals — an excellent way to land more business. Over the years, my marketing plans have shifted from being long, boring documents to quick summaries of just a page or two. Instead of writing pages and pages regarding each newspaper’s demographic and geographic reach, and how it’s relevant to whatever campaign we’re planning, I’m likely to scribble down: "Classifieds, $100 worth on Saturdays for ten weeks in Daily Planet. Contact Clark Kent, Ph. 555-5555." Do what works in your case, not what the so-called experts do. That approach works for me only because I know the local newspapers and their readership, and, through experience, I have a general idea of the impact of those advertisements. A two-page summary might not work for the next person, who might need a plan that contains a little more documentation and review. Whatever the size of your plan, there are a few essential points that you’ll need to include. The first thing your plan needs is a goal. Make it simple, and make it achievable. For example, your goal might be as simple as to sign up four clients within two months. It might be to generate sales of $10,000 within a month. Or even to have ten prospect meetings within two weeks. Make the goal as specific as possible — no airy-fairy language like "My goal is to implement an appropriate range of actions to assist clients in developing effective web-based strategies." Not only are all of those five-dollar words hard to spell, but they’re too ambiguous. You need something simple, easy, and measurable. Okay, you’ve set a simple goal — now, take a look at your market. Using the example from before, you may have defined your market to be small businesses within a 50-mile radius, participating in high-tech industries. As we discussed earlier in the section called "Defining your Market", perhaps you’ve also completed a survey to find out exactly how these companies choose web developers. Maybe you also asked about their level of interest in web development and what factors influence the decisions they make — you might find, for example, that they’re all members of the local chamber of commerce. Once you have this information, you’ll be better armed to attack that market for best results. When you start business you want as many clients as you can get as quickly as you can. Complete a competitor analysis using the research techniques we discussed in Chapter 2, Business Planning, Research, and Competition. For each competitor, make sure you know who, what, when, where, how, and why. See how they advertise. Review their client list. Benchmark against them. Now, plan to beat them! Competitor information is relevant to your marketing strategy in a number of ways. First, when you review a competitor’s strategy, you need to ascertain whether simply copying their approach will be enough. It works for them, so it should work for you, right? Well, it sounds reasonable enough, but in practice things can be a little different. Established businesses have established names. There’s an element of trust associated with their longevity in the industry — I don’t think I have ever seen an industry from which so many people have dropped out! — and that equates to sales, often via referrals. As we know, referrals are often the best way to generate new business. If you do exactly what the competition is doing, as the new kid on the block, you’ll almost certainly fail. You need to identify successful strategies that you can apply to your business, and apply them with a twist, a point of difference. You need to be different so that you stand out and become noticed. If your competitor generates business through direct mail, then perhaps a direct mail campaign that incorporates a competition might work better for you. As long as you can develop your own unique angle, your campaign’s potential for success will soar. If you’re noticed, you’re known. That’s half the battle of attracting clients. The information you’ve gathered on your competitors might also help you decide to adopt a strategy of competitive opposition. This can be highly effective in helping you move from a saturated and cluttered market to one where you may well be the only industry voice. Let’s say your competitor has a strong presence in the local newspaper. By the sheer volume of ad space they’ve bought, and the length of their association with the paper, the competitor may have that particular market segment covered. Your small advertisements may not be able to make a big impact. However, if you know that this advertising works for the competitor, it may be time to commence an advertising campaign in competing magazines and journals. You have the advantage of knowing that print advertising works for your competitor, along with the added benefit of having a good chance at winning a decent slice of an uncluttered parallel market. What message will you communicate through your marketing efforts? This is a key consideration — the quality and clarity of your message can mean the difference between an excellent response and an ordinary one. attention – Your message must grab the attention of your market. interest – The prospect has to become interested in what you have to say. desire – Your message must spark within the prospect a desire to obtain the benefits you offer. action – Ideally, your message will prompt the user to take action towards procuring your services. The important point here is that nothing’s going to happen as a result of your marketing unless you grab people’s attention. Do whatever it takes. This is why I did the radio show, why I do the public speeches and why I advertise — all of those tricks gain the attention of the target market. Tell prospects their problem, then offer the solution. Once you have the prospects’ attention, you should restate their problem — a good way to express that problem is they don’t make enough money through their current business channels. Next, you offer them a solution to that problem — that’s your pitch. Finally, you ask them to take action — ask them to contact you. Being outrageous attracts attention, and it’s attention that you’re after. A by-product of being outrageous is that you’ll often be entertaining as well — and a lot of clients like to be entertained. They want a good job, a real solution, and professionalism, but make your prospects enjoy themselves — cause them to laugh — and you’re off to a great start! Okay, so now we have a good picture of advertising, promotion, and PR for the freelance web designer. The point here is that you need to implement many different marketing techniques on an ongoing basis. Running seasonal campaigns is good, but continual promotion via a number of means is far more effective. Only then will you generate a healthy number of prospects for your business. This brings us to an important point: the whole idea behind marketing is to generate interest among your target audience. More than that, the purpose of marketing is to generate leads — leads that will evolve into sales. In order to ensure that you use your marketing budget to your best advantage, you must do one thing: measure the cost of every response. Measure the response to every marketing technique you implement. It’s a simple process to analyze the benefits per dollar of everything you do — and it’s even easier if you use the Marketing Budget in the Budget file and the Marketing Activities Analysis Sheet included on this kit’s CD-ROM. Assuming you generate a healthy 30% profit on the jobs themselves — that’s $1,800 — you need to deduct wages for 23 hours of extra work (a minimum of $690). Also deduct $200 for the advertisement itself, and maybe another $100 for overheads such as postage and petrol. That reduces your $1,800 profit to a return of just $810 for your original investment of $200. This is a fairly simple example, but keep in mind that the benefits you receive from many strategies may not be so easily quantified. Whether you follow any of these advertising, promotion, and PR suggestions is up to you. Just do it! Think big; isn’t it time for you to be attracting those clients that everyone else seems to reach? Make a plan! Identify your objective, and how you’ll reach it. Consider the market and your competition. List the tools you’ll use to market your business, and the message you’ll promote. Measure the results of everything you do. We kicked off this chapter on the theme that doing something was better than hypothesizing about what you could do. This is definitely the case when it comes to marketing. If you have an idea that a particular tool or approach might work, try it, test the results, and adjust your future activities accordingly. Don’t procrastinate! Get out there and do it! We qualified this approach of mine with some key marketing theory, beginning with a discussion of how to target your marketing efforts. We talked about defining and reaching particular target audience segments, and how you can attract prequalified leads through targeted marketing. Next, we discussed in detail your marketing options. First, we addressed the issue of assessment, so that you could identify which marketing tactics and tools might be valuable for you. Then, we launched into a review of the more popular and affordable marketing options available to the budding freelancer or small business owner, and I provided a PR primer for your use in attracting media attention to your work. Lastly, we looked at developing a marketing plan that contained achievable goals, a market and competitor analysis, a detailed strategy, the marketing message, and addressed the all-important aspect of measurement, without which your marketing efforts would lack direction. Let’s continue to discuss the ways you can work to establish your freelance or small web design business. In the next chapter, we’ll cover the development of a strong competitive advantage, or unique selling proposition, which will help you distance yourself from the competition and really stand out from the crowd. In the meantime, download this chapter and three others from The Web Design Business Kit 2.0, and check out the The Web Design Business Kit for more information on what it covers.